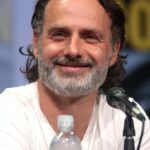 Andrew James Clutter buck better known by his stage name Andrew Lincoln, is an English actor. He is most recognized for his portrayal of Rick Grimes, the lead character in the AMC post-apocalyptic horror television series—based on the eponymous comic book series of the same name—The Walking Dead. His first major role was in the BBC drama This Life, followed by roles such as Simon Casey in the Channel 4 sitcom Teachers and Mark in the Christmas-themed romantic comedy film Love Actually (2003). "Atlanta is an incredibly cool city."